I was very honored with the opportunity to catch up with O'odham and Yuman fashion designer Cher Thomas, owner of Cher Thomas Designs, about her most recent work. I first became aware of Cher's clothing designs while I was going to grad school in Arizona. She is a member of the Gila River Indian Community and I had seen her work in local shows. As a third generation seamstress, the act of making garments - both traditional and fashion-forward - runs in her family. She was recently featured in Native Max Magazine, and in June she was spotlighted in the Brave Wings Charity Fashion Show held in Scottsdale. Here, she debuted her Spring 2013 collection, Desert Ballerina. Click below to read my interview with her about this fabulous show. BB: Cher, thank you so much for taking the time to answer a few questions about your latest work. The pictures from the fashion are great! - When did you start planning and making this collection? CT: I started conceptualizing this collection in January of this year. Sketching occurred in February and production happened in late March to mid April. However, the collection didn't become refined and finished until mid June. BB: That's a great schedule for design! What were some of your inspirations for this new collection? CT: Traditional dancers! I watched a lot of documentaries about Russian ballet and the discipline and grace displayed by the ballerinas were the same as traditional dancers of my tribe. Some families in my tribe teach their daughters to dance as young as 4 years old. Their children grow up with that strength, discipline and natural grace; and I wanted to celebrate those characteristics as that is what's needed for our People to prosper in the future. BB: That's a beautiful inspiration point, and it is clearly reflected in the shimmery fabrics of the garments - What materials did you used for these designs? CT: A lot of satin, some cotton and a tiny bit of chiffon. Those two fabrics are most widely used by my tribe for traditional attire. BB: I can always recognize your work by the use of satin, bold border patterns and silhouettes. To me, you have a clear design aesthetic, but can you tell us how this collection relates to or departs from your other collections? CT: Most of the collection are brand new pieces, some are revamped pieces from previous collections. All of my collections somewhat fit together in their aesthetic; especially when it comes to the running borders I use and even the pleating I do on skirts and blouses. They are all inspired by modern O'odham and Yuman traditional dresses. This season is different in color, the light and airy fabrics used, and even the cuts of skirts are different. Each season is like a new chapter of a book; each are its own entity, but still part of a collective story. BB: What do you think is the easiest part about being a designer? CT: The hours. I make my own hours and can work all night if I want to and I can take time off if I need to. As long as my orders get completed in a timely manner I'm good. However, I have a pretty jam packed schedule to maintain and "time off" is becoming more and more rare. CT: The hours! Haha! I usually sew from 2PM to 5PM and again from 12AM to 5AM. I sleep for about 6 hours, wake up and have client appointments from 12PM until 5PM and then I start sewing gain. I only get out of the house for dinner and special events! BB: The Brave Wings Charity Fashion Show looked like it was a great success - what was it like being a part of this event? CT: It was a good process, I love doing charity fashion shows. It's like, my art can actually help others! I love giving back to the community through my work. Domestic violence is something that has greatly impacted my own family and the Sojourner Center in Phoenix has helped many women regain their safety and sense of control over their lives. It is an honor to help fund their important work. 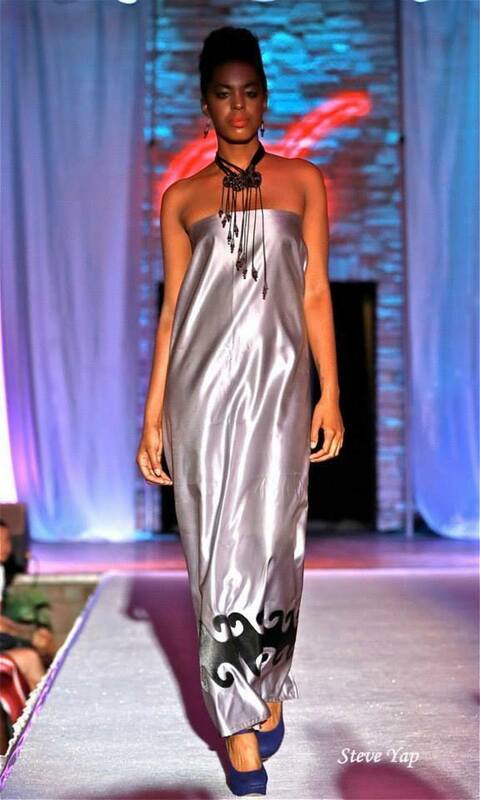 The coordinators, Jenesis and Mabelle were very supportive of my work and allowed each designer to really shine. It was a fun event seeing the other designers' work, especially Native designer Orlando Dugi's show-stopping collection! I finally got to meet him, he's one of my fashion heroes! Overall, The Brave Wings Fashion Show was a humbling experience to say the least. BB: That is amazing! It sounds to me like you have accomplished much, and will continue to do great work through your art. Do you have any advice for aspiring designers? CT: Yes, and that is to create beauty. In everything you do, create beauty. There is so much ugliness in this world and beauty is so fleeting. Stick to your guns and create what you find beautiful, be bold and daring in your approach, but always keep the prospective client in mind. And above all, remember: fashion is an art, but it's a sellable art! This is a business and a sharp business mind is required for this industry. record in the earth and it's really multipurpose. Wow, the dresses are beautiful prints. Interesting blog post, I am hoping the same high-grade blog post from you in the upcoming as well.